Long-time fans may remember this Ballantine publication from the '60s heydays of the Edgar Rice Burroughs' paperback boom, but the fans who weren't reading Burroughs' books then (I didn't start until 1970), may not be aware of this sci-fi adventure novel by Burroughs' younger son. 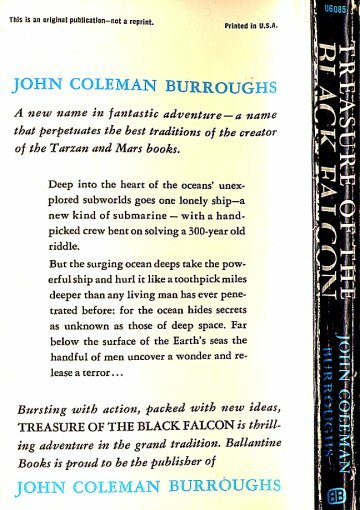 John Coleman Burroughs wrote the novel in the 1940's, but failed to find a publisher. The manuscript was then filed away until brother Hulbert discovered it in the 1960's, when Ballantine decided to add it to their Burroughs lists. (JCB therefore dedicated the book: "To my brother, Hulbert, Who found the Treasure"). 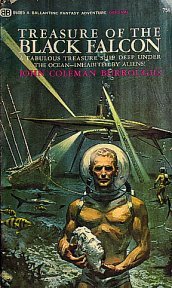 When I came across a copy in a used bookstore a few years ago, I bought it not just to collect it, but with the intention of someday reading it, despite the sub-heading on the cover: "A FABULOUS TREASURE SHIP DEEP UNDER THE OCEAN—INHABITED BY ALIENS!" and in spite of the inverted goldfish-bowl helmet worn by a rather Sea Hunt/Lloyd Bridges-esque diver (deep under the ocean, but still nearly naked to show his sculptured muscles) featured prominently on the cover. I have now read this one-and-only novel by Burroughs' artist son, and am pleased to report that it is well worth reading. I offer here a brief synopsis and review for those who think that they might want to read the book themselves, followed by a detailed summary and commentary. I found copies of the book for sale at online sites (at prices ranging from $8 to $15); however, I was unable to find an adequate description of the story, so I hope my contribution may prove both interesting and useful to someone. If you want to read the novel for yourself and want to retain all of the suspense (and mystification), stop now! It is 1947 in the mid-Atlantic. Dirk Gordon and his friend, Von Benson, deep-sea salvage divers and former WWII submarine commanders, are now co-captains of the new, innovative, ultra-deep-sea salvage submarine, the Ellen Stuart. With them on this voyage to the bottom of the sea is the sub designer, Phillip Montague, and Phillip's fiancée, Ellen Stuart, for whom the sub is named. Ellen is the descendant of a British ship captain whose brigantine, the Black Falcon, went down along with two others (the Royal Prince and another, name never given) in the mid-Atlantic in 1765. These ships were carrying millions of dollars worth of gold and jewels, so with an assorted crew joining them for a share in the treasure, they dive down to the bottom of the ocean, to unprecedented depths. A vortex then suddenly engulfs the sub and pulls them deeper still, for a journey of ten hours through a long tunnel, to an unearthly world of a vast array of bizarre creatures, lighted only by phosphorescent minerals and luminescent fish. They eventually reach the wreckage of the brigantines – after a couple of deaths, a few adventures, some bizarre occurrences, and much suspense – to find the gold. However, competing for the gold is a race of truly unique beings, called Jogulars, whose appearance may be human, but whose actual nature proves both ingenious and surprising. The city of the Jogulars then provides the story with a rightful king and queen, a foul usurper, a vile traitor, and further adventures – including brain-washing, dungeons, civil uprisings, and other frolic. The weaker parts are: a bit more suspense than actual adventure, very little humor or comic dialogue, and a somewhat obligatory love story. The writing style is clear and efficient, but not overwhelmingly exciting in itself. The aspects of the novel most like his father's writing show up somewhat late, and this part then goes by too quickly, forcing some major mayhem to occur offstage. The better parts are: some interesting characters, including the girl Ellen, her fiancé Phil, and the ship's doctor; many complex occurrences that are then tied together nicely; also – as might be expected from an author who is primarily an artist – the visual aspects of the scenery and creatures are fully described and realized. The true nature of the Jogulars is also quite intriguing and unusual. (JCB's scientific explanations provided in the footnotes make for some fun discussion, as well.) The resolution is satisfactory, and overall, this journey to the center of an Atlantian abyss – to find new life-forms of ancient civilizations where no man has gone before – offers enough similarities to, and differences from, the work of other authors (his father's included), and enough science in the science fiction, to keep it interesting all along the way. The Jogulars don't exactly "inhabit" the treasure ships, they live in a city nearby, and go to the ships seeking the gold, the same as our heroes do. The "Aliens!" reference is also somewhat misleading, as neither extra-terrestrials nor other planets are actually involved. It comes from speculation that the Jogulars may have begun life in the sub-basement of the ocean when a meteor struck there millions of years ago – and in the last chapter, the meteor bit is amended to its possibly having been a spaceship. Also, the doctor does use both the terms "foreign" and "alien," but meaning "not native to the human organism," rather than specifically E.T. No flying saucer actually puts in an appearance, despite the one seemingly displayed in the background on the cover. It seems likely this is meant to be the submarine, but drawn all flat and spindly so as to look like something from Forbidden Planet or Lost in Space, if it somehow got crossed with a big underwater wasp (which creature does appear). Lastly, the Black Falcon went down in 1765 – a mystery which was therefore 200 years old, not 300 as the back cover states. This story was told to me by a chance acquaintance who wished to remain anonymous. As the chronicle was being narrated, my new tape recorder spun through a dozen reels; but after my storyteller had concluded and had said good-bye, I discovered that the second half of the recorded reels had obliterated much of the first half, for I had not turned all the reels properly on the second time around. A frantic call to the hotel revealed that my new friend had already checked out. I traced my storyteller to San Pedro Harbor, where I learned the culprit had boarded some kind of submarine that had just cruised out of the breakwater and submerged not ten minutes before. The name of the vessel was shown in the harbor master's log as The E.S. Its destination was simply a point on the waters of the broad Atlantic. The name of the Skipper was signed "A. Jogular," which, as you will discover, was about as anonymous as one can be. All this is to explain any weaknesses that the reader of this manuscript may encounter. The tale has been reconstructed from the incomplete set of tapes, some notes, and my memory. Errors and inconsistencies must be mine. Please remember, gentle reader, that I am neither a scientist nor a writer, but an artist of sorts. My only knowledge of a submarine was acquired from a wind-up toy my father gave me soon after the invention of the wheel. Anyway, here is the story. If your taste is anything like that of your Editor and your Author, you will be utterly captivated by it. WARNING: Spoilers ahead. Stop here if you plan to read the book yourself sometime soon and don't like to know ahead of time. Ellen Stuart, the girl – Phillip Montague's long-time fiancée and co-financial backer of the sub. She proves to be strong and intelligent, comforts mute Bucky when he's afraid, nurses Phillip when he's badly injured, fights against brain-control attempts by undeveloped Jogulars, faints a bit too easily (according to Dirk Gordon), and is loved/lusted after by Von Benson. (1) Dirk Gordon, commander of the submarine and our protagonist – A salvage expert; a large man with light blue, enigmatic eyes deeply set in a tanned, ruggedly chiseled head; distrusts women since he was once badly hurt by one; a submarine commander during WWII. (2) Lieutenant Von Benson, co-commander of the submarine – Another salvage expert and Dirk's best friend; a big, good-looking young man with laughing eyes, after the "gold and lots of it!" Von is apparently his first name. As he was also a sub commander during the war, and is now co-captain of the Ellen Stuart, it is not clear why he is referred to as Lieutenant. He also seems to have the greatest libido on board the sub, as he is the only one actively hitting on Ellen. (3) Phillip Montague, ship's designer, builder and co-financial backer – Ellen's fiancé; a tall, thin, almost ascetic appearing man; an Oxford man and an Officer in the Royal Navy; a brilliant ship designer whose first, revolutionary, submarine design is the Ellen Stuart; he also designed the deep-sea diving suits they use. He spent the last year of the war in a prison camp at Dachau where he met the American salvage divers, Dirk and Von; however, they escaped before the war ended; Phillip is still recovering from this experience. He will break his arm, rupture his kidney, and then suffer a mysterious parasitic infection that proves fatal, but this will not stop him from making future appearances. (4) Dr. Kingsley, ship's doctor – a short, plump, jolly little man with a memory to rival Sherlock Holmes; given to phrases such as, "A capital idea!" He has an interesting secret (revealed in the Chap. 6 description below). (5) Willoughby, radio operator – a crack radio and radar technician, with heavy, horn-rimmed glasses; given to whimpering, mumbling, and praying in an emergency, which is a clue to a later, startling development (see Chap. 7). (6) Chief Engineer Pigeon Ellis – a big man, ex-marine, given to phrases such as, "Wottinell is that?" His engineering skill eventually proves to be somewhat useful. (7) Quartermaster Andre "Frenchy" Dumas – has a tiny mustache and a little spaniel dog; given to phrases such as, "Mon dieu – cripes!" and "Zee thing ees as big as zee sub!" (8) Mr. Flobs, ship's cook – a tremendously fat Cockney. (9) Sergeant Grube, salvage operations room – has gold-capped front teeth and a bald, bullet-shaped head; will be found shot in the back of the head with a .45; his distinctive teeth and head will be useful in knowing for sure that it's him. (10) Henry Wicks, battery room operator – will die suddenly and mysteriously on an excursion outside the sub, but this also will not prevent later reappearances. (11) David Hill, Ellis' chief mechanic – had been a cattle trader in Nevada; he follows the tracks of those who stole the gold, returns four days later, mutters about a city and dies; but he also returns for the finale. (12) Packard, one of two young coxswains (a coxswain is someone who steers the boat – the sub apparently has one fore and one aft). Bucky, the stowaway mute – [not counted as a man, apparently, if the number thirteen is to stand, unless Grube, Wicks, or Hill did double-duty as "the other of the two young coxswains"] – the strangest of the sub's crew, he seems to have walked from Scotland to the south of England where he stowed away in the mistaken belief that they would take him to America, without even realizing the ship was a submarine; he is a young, blond, buck-toothed, pimply-faced, weak-chinned lad with nothing but the stub of a tongue in his mouth; they put him to work as a galley assistant; he cowers in fear clutching Frenchy's spaniel, then dies at the first opportunity; however, his head returns. Stuarts in the 18th century: Captain Roger Stuart, Ellen's five times great grandfather; Barbara Stuart, his wife and her equally great grandmother; Jane Stuart, their daughter, who was married to a rogue who had deserted her, so she retook the name Stuart, thus enabling her descendant, Ellen, to carry on that name. Roger Stuart, King of the under-ocean city of Plymouth (currently deposed), Ellen's five times great grandfather. Queen Barbara Stuart, his wife and Ellen's equally great grandmother. They were chosen by the Jogulars of the city to be their King and Queen some one hundred years earlier. Fecus, who usurped the throne a few weeks prior to our heroes' arrival in the city; Volgus, one of his guards; "The bos'n," commander of guards in service to Fecus. Jim Peacock, innkeeper and Stuart-supporter; Ezekiel, dwarf stonecutter and Stuart-supporter. Other assorted guards, warriors, brain-things, and various bit players whose names are not given.